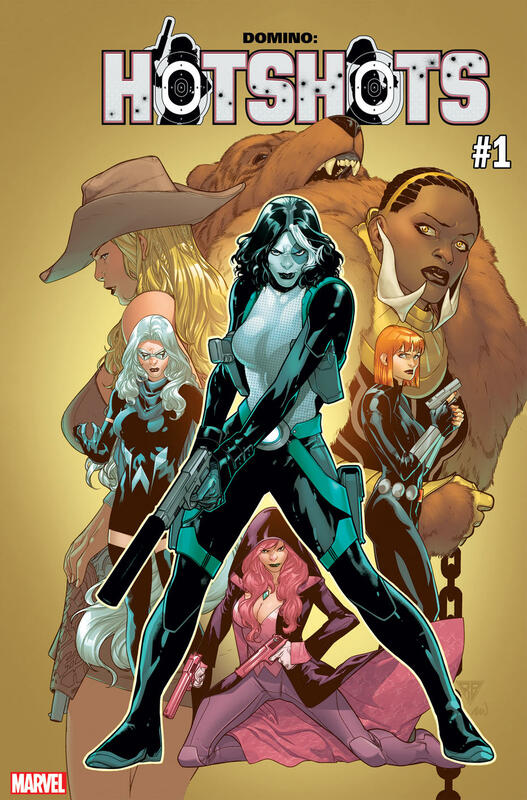 Last year, Gail Simone and artist David Baldeon headlined the newest DOMINO series about Marvel’s luckiest mercenary. But even when Domino’s luck failed her, she had strong friendships to fall back on. Domino, Outlaw, and Diamondback have been collectively known as the Posse, but now, you can call them the Hotshots! Simone and Baldeon are re-teaming for the five-issue DOMINO: HOTSHOTS miniseries, which will put Domino and her friends at the heart of a deadly international mystery. Fortunately, the team is about to expand, and these leading ladies are about to become an even greater force to be reckoned with. To get everyone ready for DOMINO: HOTSHOTS #1, available now, Marvel.com is breaking down everyone on the team, including the new additions! The first time fans met Domino, it wasn’t really her at all. Copycat impersonated Neena Thurman for months while the genuine article was a captive. But once she was freed, Domino became one of X-Force’s most important members. She mentored the young heroes and eventually joined the X-Men as well. Years later, she was also a part of pack of anti-heroes who formed Weapon X. But Domino is an adventurer at heart and one of the top mercenaries in the world. In addition to her probability-altering luck powers, she’s a phenomenal marksman and fighter. She’s also up for robbing bad guys of their ill-gotten funds. Together, with her best friends Diamondback and Outlaw, Domino formed the Posse. As a trio, they have an unshakable bond. Inez Temple is the wild card of the team with the superhuman strength to back up anything the plan needs. 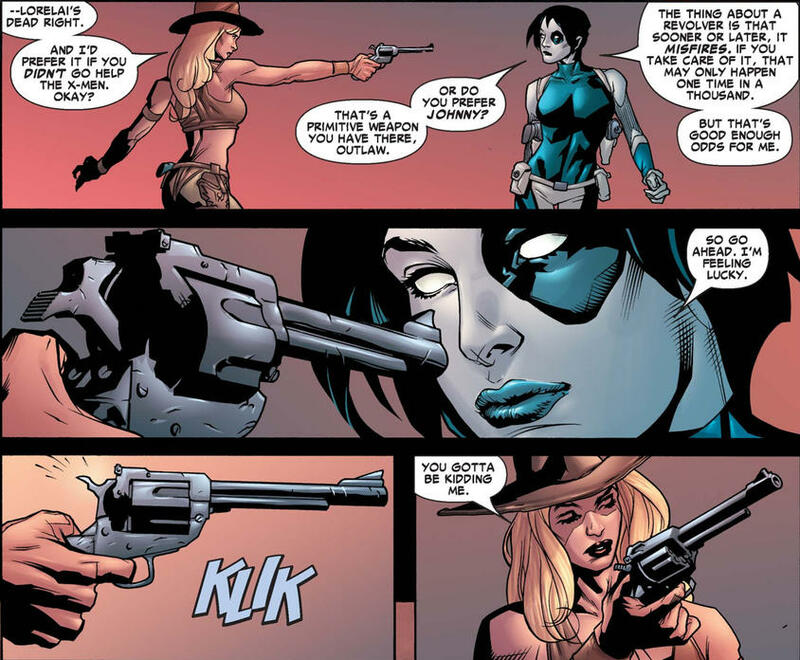 Like Domino, Outlaw has an uncanny way around weapons and both share a history with Deadpool. One of Outlaw’s first encounters with Domino came in CIVIL WAR: X-MEN, when Domino, Shatterstar and Caliban freed 198 mutants from the forced relocation camp at the Xavier Institute. 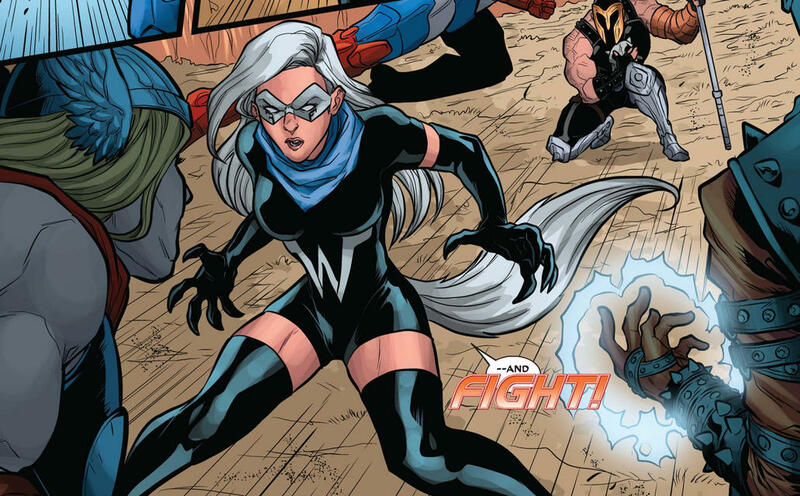 Even though Outlaw was forced to fight against Domino, she eventually snapped out of it and took on a leadership role with her fellow mutants. Since then, Outlaw and Domino have formed a very close friendship. Rachel Leighton was once a villain and a member of the Serpent Society. But Rachel’s infatuation with Captain America ultimately led her to side with him over her teammates. As Diamondback, Rachel was briefly Cap’s partner and even his girlfriend. While their relationship didn’t ultimately work out, they remained fairly close. DOMINO #3 revealed how Diamondback and Domino first met. Diamondback broke into a private collector’s vault without breaking a sweat. Domino was so impressed with Diamondback that rather than turning her in, she instantly offered Rachel a job. That was the birth of the Posse as we knew them. 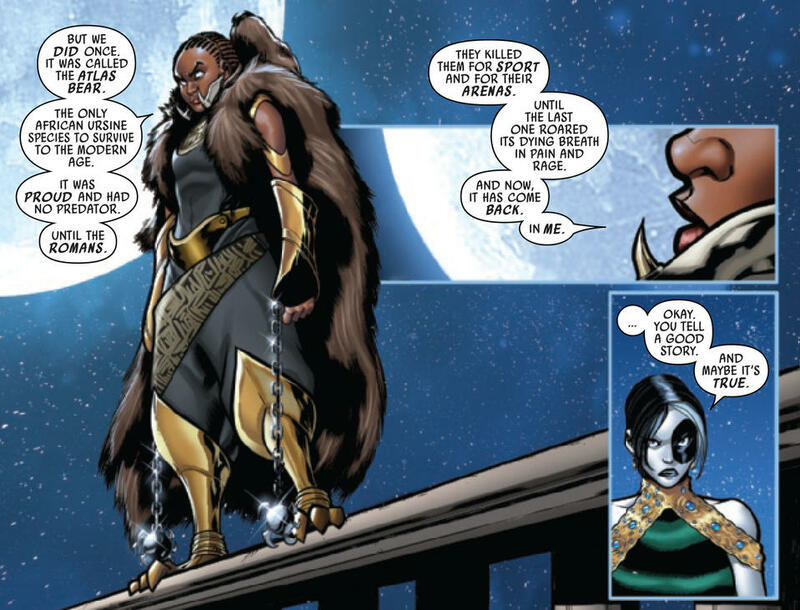 Atlas Bear aka Shoon'Kwa is a recent addition to the Marvel Universe who made her debut in DOMINO #9. She is a 16-year old Wakandan expatriate with the power of mystical clairvoyance, and she wanted the Posse to kill Longshot to avert a cataclysmic future. Unfortunately, Longshot and Domino’s luck abilities caused their respective powers to temporarily abandon them. Domino refused to kill Longshot, especially when she saw how sick he was. Even Shoon'Kwa was moved by Longshot’s selflessness, although she still regarded him as a ridiculous man. She fought alongside the Posse to save Longshot’s life before asking Domino to make her a member of the team. Ami Han is said to be the last of the Kumiho, a shapeshifting mythical race of nine-tailed foxes. As White Fox, she is one of South Korea’s most prominent heroines and a member of the South Korean National Intelligence Service. During the Post-Secret Wars CONTEST OF CHAMPIONS, White Fox was one of the heroes who was forced to compete in the gladiatorial games. Fortunately, White Fox made her return to Earth, and her powers make her a valuable addition to the Hotshots. So far, we know White Fox has enhanced senses and the ability to communicate with animals, as well as claws that can take out almost any enemy. Never bet against her in a fight! Natasha Romanoff has a long history as a Super Hero and as a spy. But it wouldn’t be inaccurate to call the Black Widow lucky as well. After all, she got a second chance at life following her brutal demise during SECRET EMPIRE. 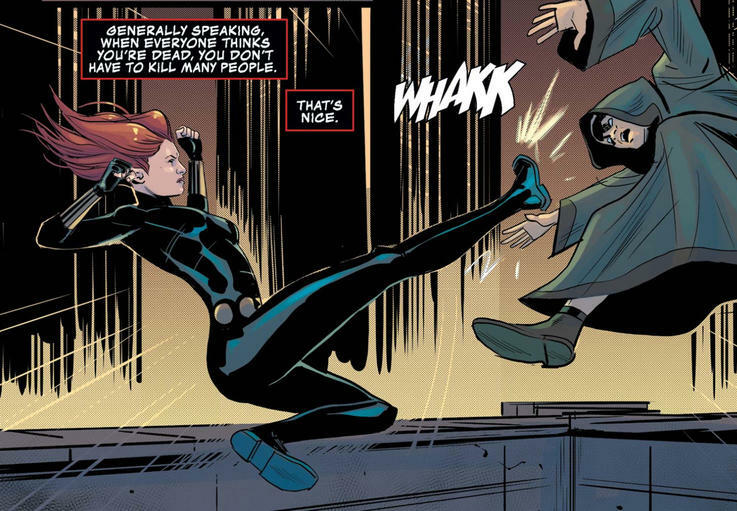 Now, the Black Widow is back on the prowl and once again a major player in the Marvel Universe. We don’t know how Black Widow will cross paths with the Hotshots, or if she will join the team. But we can’t wait to see the sparks fly when these women come together for DOMINO: HOTSHOTS #1! DOMINO: HOTSHOTS #1, written by Gail Simone with art by David Baldeon, is on sale today online and at your local comic shop!